Building a successful practice and standing out in the crowded mental health profession requires a great deal of time and energy. The Therapist’s Newsletter Kit helps you build your practice and communicate with past, present, and future clients. This timesaving tool provides mental health professionals with 50 ready–to–use newsletters on topics of current and popular interest that can be quickly and easily tailored to promote your practice. The Therapist’s Newsletter Kit does most of the work for you. In addition to the 50 well–researched articles that range from stress management and processing grief to improving your marriage and parenting skills, this valuable book also includes a CD–ROM containing all of the newsletter content in Microsoft® Word format, which you can personalize and paste onto the accompanying newsletter template. Generating informative newsletters that maximize your practice’s visibility has never been easier, thanks to The Therapist’s Newsletter Kit a source no mental health practitioner should be without. 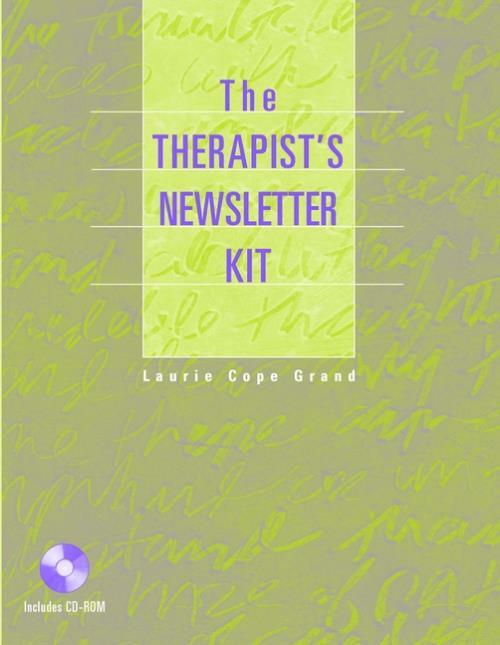 Section I: Introduction to the Therapist′s Newsletter Kit. 33 Ways to Use Your Journal for Self–Discovery and Self–Expression. Addiction: How to Recognize It and What To Do about It. Depression: What It Is and What to Do about It (Part I). Depression: What It Is and What to Do about It (Part II). How to Be More Self–Confident. How to Have More Self–Esteem. Moving beyond Grief and Loss. How to Be Less of a Perfectionist and Enjoy Life More. What to Do about the Holiday Blues. What Is Solution–Focused Therapy and How Does It Work? Suicide: Warning Signs and Treatment. What Is Hypnosis and Can It Help You? I Have Everything I′ve Ever Dreamed Of: Why Am I Not Happy? How to Forgive Another Person for Past Hurts. You Can Have Excellent Listening Skills. 12 Rules for Constructive Communication. You Can Build Your People Skills. 29 Ways to Keep Your Relationship Tuned Up. Dealing with the Emotional Impact of Infertility. Parenting Your Teen with Less Stress. Skills for Making Your Marriage Thrive. How to Manage Sibling Rivalry. How to Help Your Child Have Strong Self–Esteem. An Emotional Survival Guide for Teens. Does Your Company Need Family Therapy? Develop Your Personal Negotiation Skills. How to Give Effective Performance Feedback. How to Manage Conflict at Work. How to Recover from a Career Crisis. Should You Leave Your Job?